This July 24, 2015, file image, made available by NASA shows a combination of images captured by the New Horizons spacecraft with enhanced colors to show differences in the composition and texture of Pluto's surface. A new theory suggests that Pluto may actually be a giant comet. Pluto was downgraded from planet to dwarf planet in 2016, and now, scientists say the rock may actually be a sort of giant comet, having formed when a billion or so comets clumped together during the solar system's early days, NBC News reported. 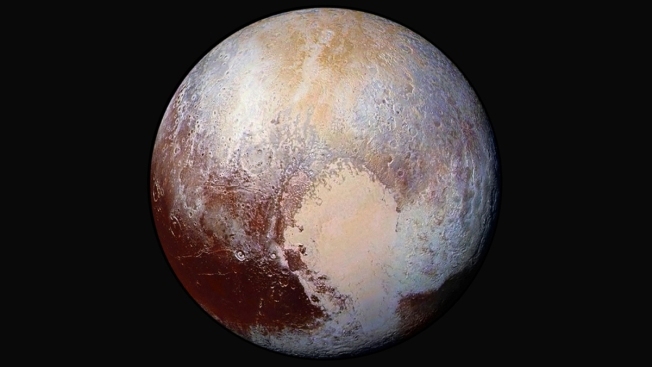 The new "cosmochemical" theory is described in a study published May 25 in the journal Icarus in which scientists looked at the composition of a vast glacier that forms the left lobe of a heart-shaped feature on the surface of Pluto. "Using chemistry as a detective’s tool, we are able to trace certain features we see on Pluto today to formation processes from long ago," Christopher Glein, a senior research scientist at the Southwest Research Institute in San Antonio and lead author of the study, said in a written statement. "This leads to a new appreciation of the richness of Pluto’s ‘life story,’ which we are only starting to grasp."